I've been writing reviews of many products from Health, Fashion, Lifestyle, Food, Mobile Apps and Gadgets. Now, I am going to review STARMOBILE SKY which I purchased from SUN CELLULAR Group Plan. As far as I can remember, the last gadgets I've owned and give a review is my Lifeware FabTab Quadro 7 from PLDT. 'Twas an overwhelming post because it reaches 130+ comments/complaints/inquiry from my readers in a span of 3 months and been my number 1 Popular Post for a year now. Glad that my post help you in a way, that it answers your query or it enlightens your usage of the product. I choose this unit aside from the other selections because I go after with the camera, it has a 8MP BSI Rear Camera and Smart Camera Controls that recognizes tap or voice commands. Multiple Gestures that allows you to use 2 or 3 more fingers to execute a commands. CALL & TEXT Filtering, restrict incoming call or text. Double tap to wake and sleep. An honest review will not embarrassed a certain product, right? But will give the product manufacturer positive suggestions that help guide them to make the brand product more usable and technologically perfect in the future! I got the unit last May of this year. The unit is in good shape and it has good performance within the first three(3) months of used. I just started having problems after about four(4) month of usage, wherein I need to delete some of the installed apps and restore my system two times in a week. I don't know how the problem started, I have so many presumptions. Maybe because of my SD Card(FREE from STARMOBILE SKY as you purchase the unit) or an ANDROID problem. the performance of the camera. The FLASH is not working properly when you are in a dark area, even if you already adjust the settings the exposure is still not good. As a blogger, you really need a nice capture of a certain photo even if your just using a mobile camera or a Smartphone. Though photography really need to be able to anticipate and capture some nice shots you should know how to adjust the lenses of camera as well. As they said, you don't need a DSLR to take great photos. SMARTPHONE can give you the best photo capture...but not all smartphones. Now, I know the next time I am going to buy a smartphone I'm going to check the specs well. 8MP Backside-illuminated cameras are not good for bloggers like me. It doesn't give me a auto-focus of a photo that I need. Just like the photo above, taken inside a bar. I already use the camera FLASH here, but still the shot is so dark. food, the photo turn blurry or it has a low light performance. 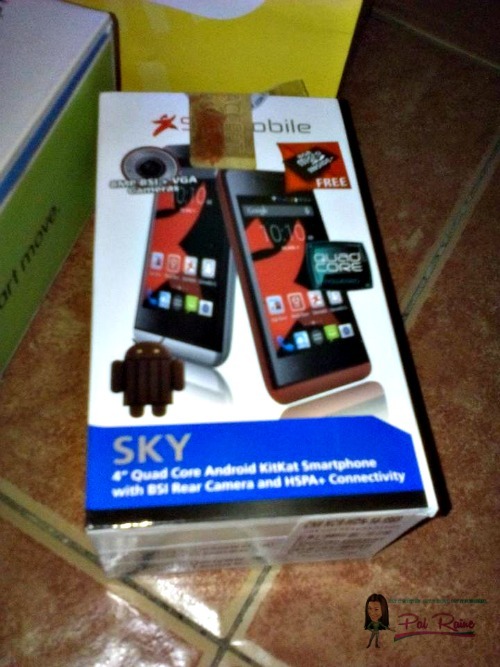 I am one of the unsatisfied users of STARMOBILE SKY 4" Quad Core Anroid KitKat Smartphone. But I have no choice, need to continue to use it because it is a PLAN under Sun Cellular. It's so cool that you can use gestures now to execute a command. I like that smart phones are now the regular camera.